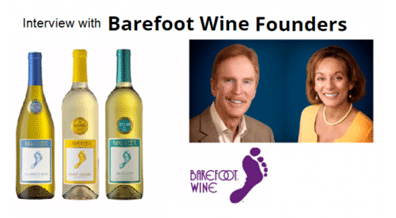 BTN interviews Michael Houlihan and Bonnie Harvey on how they built the Barefoot Wine brand and took it national. Barefoot Wines started out as a business idea between a hopeful business couple living in the Sonoma County wine country of California. With little experience in the wine industry, Michael Houlihan and Bonnie Harvey wanted to create a fun, new wine that they could build into a top selling brand across the USA. From their converted laundry room office, they set out with innovative ideas and a willingness to learn from everybody who touched the Barefoot brand. Michael and Bonnie founded Barefoot in 1986 and it quickly became known as a ‘disruptive’ label. Against traditional stogy and exclusive wine marketing customs, Barefoot was an award winning, non-vintage brand targeted at the female USA consumer with a simple, easy-to-understand label that was bursting with color and fun. Buyers were hesitant to put in what they were offering. The industry was very resistant, but Michael and Bonnie were relentless in their pursuit and fulfilled their dream. In 2005 they sold Barefoot, which at the time was one of the USA’s top selling brand, to EJ & Gallo. Barefoot has since gone on to become the world’s largest wine brand. We recently sat down with Michael and Bonnie to discuss the strategies they employed to grow the Barefoot brand into a national icon. Below is the second part of a two part interview. BTN: Would you say you disrupted the existing market when Barefoot was launched? Bonnie: We definitely disrupted the existing market and in a number of ways. First of all, we had a fun label. There weren’t any fun labels when Barefoot first came out. We were also non-vintage. There weren’t any non-vintage offerings on the market that were award winning like we were. We also designed the label specifically for a female buyer and that was really something that was quite different. We found out the major buyer of wine in California, which is where we started out, was a female shopper in chain stores shopping for her weekly staples. We wanted our Barefoot Wine to be one of those items on their list. We made it non-vintage so that we had a consistent flavor and blend, that we matched year after year. Our target female customer wanted something she could depend on week in and week out, and year in and year out. She also wanted a package that was friendly and brightly colored, and easily recognizable, so we gave her that too. The idea we are trying to get across is that you need to address a very narrow niche. You have to see how it is that you are going to attack the market. Who is your consumer and what do they want that they can’t get now? Wine has become such a commodity that unless you focus on a very narrow segment, at least at first, you really don’t stand a chance. You’ll just be an “also ran” and get beaten up on your pricing. So distinguish yourself and address an under-served market. It’s a great foot in the door. And don’t overlook American conventions and prejudices. For example, the South Americans thought they could sell wine in tetra-packs (also known as bricks.) We even tried to help them, but you know why they failed at selling bricks in the USA? Americans believe that there is more volume in a 0.75L bottle then there is in a 1.0L brick just because bottles are taller than the squat, compressed tetra-packs. Americans like tall things and just because of their diminutive stature, bricks failed in the US market. We also have another example of a beautifully bottled Riesling from Germany that tried to do something special with their 17 inch tall, elegant, blue bottle called a Hawk. Guess what? American shelves are only 16 inches tall. They were relegated only to the very top shelf. Even if consumers wanted to buy it, they couldn’t reach it! It’s little things like this that make a huge difference and you need to be ready to push your idea to the edge and this is why we encourage brands to hire professionals before they enter the market. BTN: What allowed you to successfully disrupt the market – how did you take advantage of the opportunities that you were given? Michael: The US market is really influenced by stories and current events. For instance, if you have won the LA County Fair then the next day you have POS material on every shelf and every market place in the LA area. It is really important that it is very fresh, current news. Big companies can’t work that fast because they need to go through marketing and get it approved by management. You need to have reps that work in LA that are so resourceful that they will make their own signs and put them up on the shelves the next day! When you are working for a commission, then these things become important. Some really good advice we like to give is to never pay your people on the basis of boxes alone. You have to ask yourself, “What do I really want?” Brian Tracy says that 90% of all behavioral problems in the market place are caused by compensation systems. In other words, people do what they are paid to do, so don’t pay them to do something you don’t want them to do. If you pay them to sell boxes they will sell boxes, but they will spend your entire budget to sell those boxes – they won’t consider profitability. What’s worse is if they sell boxes and make commission, but your company doesn’t grow. Here’s what we did. We told our teams, “Let’s figure out what this particular territory did same month last year. If you sell 10% more than you did same month last year we’ll give you a dollar a case on every case over that amount.” In other words, if they didn’t grow they didn’t make any commission. We would sweeten the deal by telling them that if they sold 20% more than they did last year we would give them 2 dollars a case back to every case that is over same month last year. So now, that first 10% could be worth $1 or $2. If they made it to thirty, we’d give them $3. We didn’t figure that strategy out for five years. If they ever argued about last year’s numbers being too high for some market anomaly or another, we’d just average the previous and following month into the calculation to make everybody happy. BTN: How about your biggest challenge developing Barefoot? What was it and how did you overcome it? Michael: People are always surprised by our answer, but it’s one of the biggest problems facing any new brand. “Out-of-stocks!” Some people seem to throw up their hands and say, “There’s no way I am responsible for my product once it hits the distribution channel. I have no control over somebody else’s company.” In the wine industry, that is one of the furthest things from the truth. At the very end of the day, your brand is a product and your product is only as good as it’s availability. We’ve seen some really great brands designed to succeed perish soon after they’ve gone to market due to the fact that their products were continually out-of-stock. Michael: It’s important to be on the ground running when your brand first hits the street. You’ll want to watch inventories at every level of the distribution channel. Typically, if you are marketing a new brand, spend more time out of the office and on the street. Encourage not just sales, but more importantly, reorders from wholesalers and retailers well in advance of stock depletions. Take the extra step and calculate all of your critical turn-around times. That means calculating the time elapsed from the wholesaler purchase order until goods are received, how long it takes wholesale reps to get the retail order, turn over from the wholesaler to the retailer, and how long it takes retailers to get your product back up on their shelves. It takes a lot longer than you think, and knowing all of this will allow you to take full control of your overall stock so that “out-of-stocks” don’t become your number one enemy. BTN: Finally, What are your top 5 tips for owners ready to take their brands to the USA market? Bonnie: Don’t start off with too many SKUs. It will divide the attention of the market, of the distributor, of the retailer and of your sales person. Your “brand-width” can only be so big. In the beginning it’s important to keep it narrow because there is only a certain amount of mind share that each person that is touching your product has. You tend to expect too much from them, particularly as a new brand starting off. Michael: Start in a small market geographically. Make your mistakes in an area where you can run around personally, hat-in-hand, and apologize to everybody. If you get spread out too wide geographically you are going to make mistakes and they are going to be broadcasted over your entire market. You want to start off with a Beta and just go into one area. Study, learn and apply. Get your act together before you take your show on the road. Bonnie: Attack where the enemy is not. Do not go to New York first, that’s crazy. Go to some small to mid-sized market where nobody is and make your product a big hit there. They’ll be glad to see you and you’ll make that golden reputation as a fast mover (even if it’s in a very small market). Bonnie: Learn all of your lessons BEFORE you expand. As you get into a new market there are huge lessons to be learned. Make no mistake about it, you will be making a lot mistakes. Make sure you learn all of them in one territory before you move on to your next territory. Michael: Make strategic allies. For us, we were a really an odd-ball brand. People really couldn’t understand us, but you know what? They couldn’t understand Trade Joe’s either. So, we went to Trader Joe’s and said, “We should work together.” You need to find people who are already selling what you have defined as your niche. This is the second part of a two part interview with Michael and Bonnie about how they built the Barefoot brand.The first installment discusses how they first found traction in the US market, where they found the most valuable advice and how they took the brand national.